Steiner Optics 383 Military Commander III 7x50, Binocular FREE SHIPPING! The Steiner Optics Military Commander III 7x50 binocular is a durable piece of military-grade equipment, designed to provide maximum utility in tactical operations. It features precision multi-coated optics that provide a high-fidelity image, with a Sports Auto-Focus system that only needs to be focused once to deliver clarity and sharpness at any distance. The nitrogen fill makes the interior completely dry and waterproof, preventing the lenses from fogging, and the ranging reticle makes distance estimation easy for accurate surveillance or shooting. The binoculars' durable Makrolon housing features rubber armoring for enhanced protection, as well as a floating prism system with a flexible silicone mount that absorbs impacts to save the delicate optics. The illuminated compass on the top aids in navigation, and includes HD stabilization technology that speeds up settling times for quicker readability. 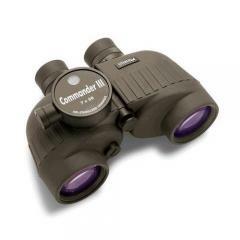 ©2002-2019 CopsPlus.com: Steiner Optics 383 Military Commander III 7x50, Binocular FREE SHIPPING!